There is quite a bit of information on the feed tag for the “grain” (concentrate) you purchase for your horse. Most people choose the feed based on price per bag and the protein content (% crude protein - %CP), with little or no regard to the rest of the information on the tag or what “crude protein” actually means. Price – When is $15.00 a bag cheaper than $12.00 a bag??? The cost of a 50-pound bag of feed is only a part of the economic decision for selecting a feed, but is where many horse owners stop the decision process. Realize that EVERY feed has a recommended intake level on the bag for specific types of horses (i.e. 6-8 pounds per day for an idle mature horse). The recommended level is the amount of feed per day the company designing the feed feels will meet the requirements for all nutrients claimed on the tag. If a 50-pound bag of feed costs $12.00, the feed costs $0.24/pound ($12.00 for 50 pounds divided by 50 pounds). To feed the recommended minimum of 6 pounds per day costs $1.44 per day (6 pounds x $0.24/pound). Another feed costs $15.00 for 50 pounds. That equates to $0.30/pound ($15.00 for 50 pounds divided by 50 pounds). The manufacturer recommends feeding a minimum of 4 pounds per day, so the cost per day is $1.20 (4 pounds x $0.30/pound). If you feed less than the manufacturer’s recommended amount, you are risking deficiencies in one or more nutrients. These calculations do not address the many supplements horse people love to add to their horse’s diet. Add those in and the cost of the “cheaper feed” per bag gets even more expensive. The feed that is more expensive per bag likely will not require extra supplements and becomes even more economical. Purpose statement - species and animal classes for which the feed is intended. Ingredients are listed in general order of amount included in the feed, from most to least. The manufacturer may list exact ingredients, for example, soybean meal, oats, barley. These are called “fixed” formulations and typically do not change with ingredient prices. The consumer can make reasonable assessments as to the feed’s digestibility and nutrient quality knowing the feedstuffs in the mixture (though the exact quality of these ingredients may still be suspect). The manufacturer may use “collective” terms for ingredients, for example, grain by-products, grain, plant protein products, animal protein products etc. These are called “least cost” formulations. Such formulations can vary from batch-to-batch depending upon ingredient costs (discussed later). Should the price of oats go up, the manufacturer can substitute corn in the mixture without changing the labeling. Use of collective terms makes it difficult to know what ingredients are used, thus makes it nearly impossible to assess the feed’s true digestibility and quality. What insight can we gain from the information on the tag? Crude protein (CP) is calculated based on the amount of nitrogen (N) in the feed: CP = %N x 6.25. ANY source of nitrogen is included in this calculation. The nitrogen may or may not be from quality protein (or amino acids) utilizable by the horse. One must use the ingredient list to determine if the protein is of sufficient quality for the horse in question (foals, lactating mares and older horses require higher quality protein than idle adult horses). Protein quality is determined by the type, amounts and balance of essential amino acids in the TOTAL diet. The best indicators of protein quality are the essential amino acids lysine, methionine and threonine. Only lysine is routinely put on feed tags and is a good indicator of protein quality, though not foolproof. Milk-based products, soybean meal and alfalfa are good sources of quality protein for horses, primarily because of their high lysine content and overall amino acid pattern. Added amino acids (especially lysine, methionine and threonine) can improve protein quality by balancing amino acid patterns. It is important to consider the CP of the TOTAL DIET – hay and grain combined!! When feeding alfalfa hay, which can be 18-22% CP, a lower %CP may be acceptable in the concentrate, depending on the type of horse being fed. For all nutrients, horses require AMOUNTS not PERCENTS!! NRC (2007) suggests an idle, mature horse requires 1.2 – 1.6 pounds (540 - 720 grams) of protein a day. The major source of protein in this case is, and usually is, the hay. 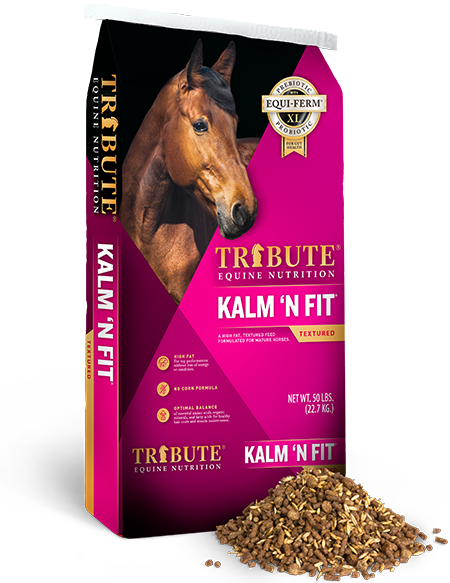 Many people are afraid of higher protein concentrates, but if they are well designed, like Kalmbach’s ESSENTIAL K, and fed properly, they can be an important part of the horse’s diet. This example says nothing about protein quality. Protein quality is determined by the AMOUNTS and BALANCE of essential amino acids in the feed. The only way to infer the quality of the protein is to read the ingredients. Soybean meal, dehydrated alfalfa meal and milk-based ingredients (like whey) are excellent sources of essential amino acids. Other sources, including the popular ingredients wheat middlings and linseed meal (flaxseed meal) do not have the ideal amino acid profile. There is more to protein quality than lysine content, as well. Other amino acids, like threonine, methionine, cystine and tryptophan need to be in the correct amounts and in balance. Thus, all 12% crude protein feeds ARE NOT the same. You need to know the source of the protein to determine the quality of the protein. A company could make a 12% crude protein feed using poultry feathers as the main protein source – if the company uses collective terms, you would only see “animal protein products” on the tag!!! Horse feeds may ranges from 3 – 15% fat (or higher for supplements). Vegetable oils (corn, soybean, rice, linseed) are best and most palatable for horses. Fats of animal origin are not as palatable for horses, though some can be blended with vegetable fat to become more acceptable. 2. Causes less metabolic stress, reduces glycemic response and decreases lactate accumulation in the hard-working horse. 3. Horses can perform longer at a lower body temperature. 4. Horses recover faster from exercise. 6. May improve behavior (by reducing hormonal response to a meal). The horse’s digestive tract has evolved over millions of years to utilize primarily fiber. Most of the fiber a horse consumes comes from his hay or pasture. Hay can be 33-40% crude fiber. As humans have selected horses over the past few hundred years to be bigger, faster and stronger, the needs for energy, protein, vitamins and minerals have increased. In general, the higher the crude fiber of a feed, the lower the digestible energy. We typically feed grain or concentrate to supply energy, protein, vitamin and mineral needs, not fiber. 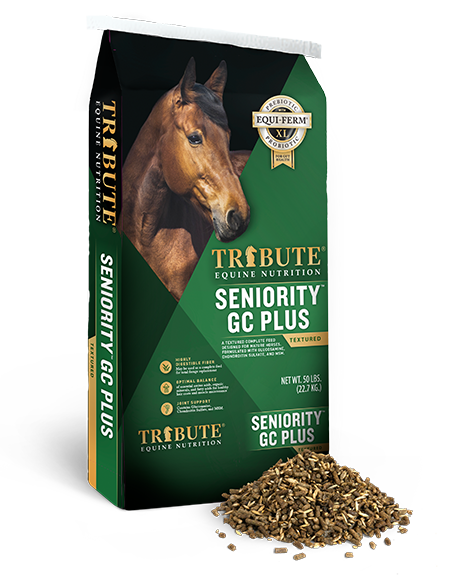 So, it is desirable to have low fiber in the concentrate, with one notable exception – “complete” feeds for horses that can no longer consume hay or pasture, like older horses and horses with respiratory problems need to be high in digestible fiber. Complete feeds will be 14% crude fiber or higher. It is important to realize that, just like protein, all fiber sources are not of equal value to the horse. The horse’s hindgut (cecum and large colon) have a population of bacteria and protozoa that digest fiber for the horse. These microbes can digest the parts of the fiber called cellulose and hemicellulose effectively. Lignin, the component of fiber the microbes cannot digest, directly correlates to coarseness and stemminess in hay. Whether evaluating a complete feed or one to be fed with roughage, digestible fiber is desirable. Since no direct measure of fiber digestibility is listed on the feed tag, we must use the ingredient list to assess the digestibility of the fiber source(s). Dried beet pulp, soybean hulls and dehydrated alfalfa meal are good sources of digestible fiber. Oat hulls are satisfactory in some circumstances, but the digestibility of good quality beet pulp can be twice that of oat hulls. 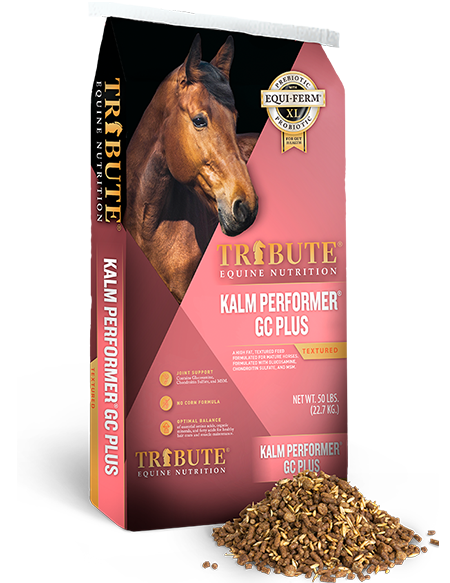 If the company has chosen to use collective feed terms, you cannot tell how digestible the fiber source is until your horse has lost condition and weight– this is especially important in the older horse and those with respiratory problems, who tend to be hard-keepers anyway and are eating high-fiber complete feeds. 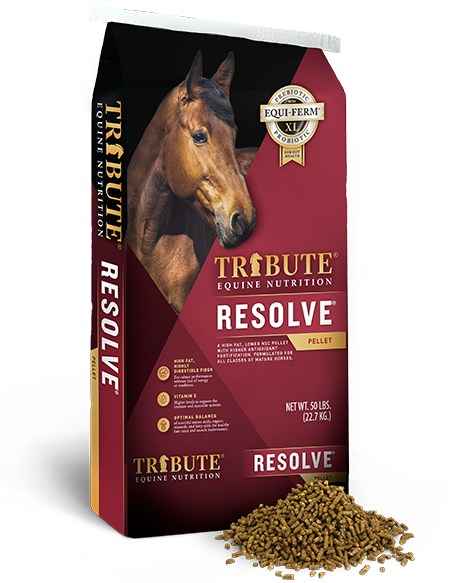 Tribute Equine Nutrition uses “chelated” trace minerals, which have been shown to be more effectively utilized than inorganic complexes. To tell if the feed has chelated minerals, look in the ingredient statement for terms like “Polysaccharide Complex of Copper” or “Copper Amino Acid Complex”. We will discuss below the importance of basing your concentrate decision on the type of hay or forage your horse is eating. This is especially important when feeding young, growing horses and broodmares, as the calcium to phosphorous ratio (Ca:P) should ideally be 1:1 to 2:1. Grass hays are usually in this range, but high quality alfalfa hay can have a Ca:P of 6:1 or higher – this can contribute to a number of developmental orthopedic diseases like epiphysitis, contracted tendons and osteochondrosis dessicans (OCD), if not corrected in the concentrate. Thus, the Ca:P in a concentrate to be fed to young horses eating alfalfa hay should actually be inverted, i.e. have more phosphorous than calcium. What Hay are You Feeding?? FEW COMPANIES DESIGN FEEDS THAT TAKE IN TO CONSIDERATION THE LARGE DIFFERENCES IN NUTRIENT CONTENT BETWEEN GRASS AND LEGUME (alfalfa, clover, lespedeza, etc.) HAY OR PASTURE. Most commercial feeds are based on a mixed grass/legume hay and may be deficient, imbalanced or excessive in certain nutrients relative to the forage being fed. As mentioned above, this is ESPECIALLY critical in young, growing horses, lactating mares, performance horses and older horses. Horse owners should take in to consideration the type of hay or forage the horse is consuming and the horse’s actual nutrient requirements when making the concentrate selection. When in doubt, consult an equine nutritionist. More is not always better – know the horse’s requirements and risks of exceeding them. 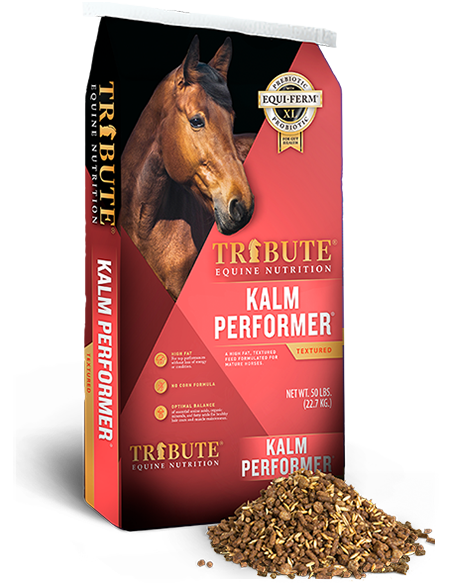 Realize a large proportion of the horse’s nutrient requirements as met with good quality hay. Need to fill nutritional gaps left by forage – the concentrate to be fed to a horse consuming a legume hay should be TOTALLY different than that being fed to a horse eating grass or mixed hay. Major gaps are in protein, energy, calcium and phosphorous (amount and ratio). Assess quality and digestibility by analyzing the list of ingredients – can only be done on feeds using “fixed” formulas that list actual ingredients. “Least-cost” formulas using “collective” terminology do not allow you to assess digestibility and quality. Many “least-cost” formulas a cheaper per pound than “fixed” formulas (hence the “least-cost” label!!) because they use cheaper ingredients. Remember, NONE of the values listed in the Guaranteed Analysis tell you ANYTHING about the digestibility or quality of the feed. You can only assess these attributes by knowing what ingredients were used in making the feed. Just because the %CP or %CF are the same does not mean the feed will perform as you expect. You are comparing these actual ingredient lists from two feeds currently on the market. Which product would you choose for your horse? Ingredient highlighted in ITALICS below can significantly reduce feed performance! The QUALITY of the ingredients DOES MATTER!!!!! The guaranteed analysis can be met with poor quality (…and CHEAP) ingredients – it will show in the condition and performance of your horse. Poor quality protein and fiber are not well digested by the horse – these ingredients will not be utilized effectively and the horse will suffer (as will your wallet!!!) by having to feed more concentrate. Make sure the feed you select is appropriate for your horse and that the guaranteed analysis is met with QUALITY ingredients. Give the feed at least 45 days to work and evaluate objectively how the feed works by using body condition scoring, body weight and skin/coat condition. If you need help, contact a trained equine nutritionist.